Today we are doing Indian takeout, but at home!! YESSS. I think I have said this before, but I am a huge homebody. I just really love being home. So much so, that I would totally choose cooking dinner at home over going out to eat. And SO much so that I’d even choose homemade “takeout” over having to get in the car, drive to a restaurant and shlep the food home…okay, that might just be pure laziness on my part, but either way homemade is always the way to go, in my opinion. Really, it is true, homemade is a million times better, plus YOU get to control over what goes into your food. Sometimes restaurants can totally freak me out. I mean who knows what they are doing back there behind closed doors… clearly, I have serious issues, but I have declared this many times. Anyway, my point is that most of these takeout foods can be made at home, and may even take less than time than ordering and picking up. They will probably taste much better too!! I have a whole list of “takeout” foods that I want to recreate at home…orange chicken anyone?!? Anything you guys REALLY want to see?? Here’s the deal, do you guys remember back in December when I announced I was partnering with Almond Breeze on their “Imagine the Blendabilities” contest? Well, today’s recipe is the recipe idea I chose to create. I had a GIANT list of recipes to choose from, and to me, this one sounded yummiest, so I went with it! Plus, cashew chicken has been on my list of things to make for way too long now. I mean, who could not fall in love with a big bowl of creamy cashew chicken, rice and naan. It’s total comfort food, but made healthier and simpler thanks to the crockpot! When I was younger, Indian food was pretty much off my radar. My family ate very average foods… and that’s saying it nicely. It was mostly, chicken, steak, pasta, so many ground beef tacos, and burgers for the first twelve to thirteen years of my existence. My brothers LOVED it, and my two oldest brothers still continue to eat the same diet. Honestly, they are both going to majorly regret the amount of meat they are consuming. Just saying. Sometime during my twelfth or thirteen year, I decided I was so over the steak and started doing some of the cooking. If you really want to get into my whole cooking journey, this is where it began, but I feel like we should try to stay on topic here. So when I started cooking, I would google things, watched a lot of Food Network and eventually started reading food blogs. 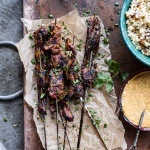 One thing or another led me to some Indian inspired recipes and I was HOOKED on their spices and flavors…plus any dish you can eat with rice or couscous I am SO in on. Cashew Chicken is a recipe I have seen and known about for ages now, but just never got around to making. Oh man, what a mistake that was. Cashew chicken is the best!! I have made this crockpot creamy cashew chicken recipe a little different than it is traditionally made, but you guys! It is SO good! Think spicy, but not overly so. Think SO creamy, but without any actual cream. And then think super cozy and crazy delicious!! It’s the perfect weeknight meal or even weekend meal. 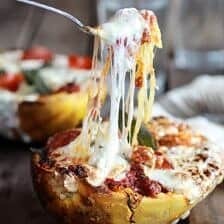 You can add everything to the crockpot before work or school or wherever you may be, and then come home to a house that smells in-freaking-credible and a delicious dinner that is ready to eat!! One little tip I have learned over the years is that, while my family loves the spices used in Indian cooking, turmeric is not one of them. So for this recipe I have adapted it slightly to my family’s taste. If you are a huge fan of Indian flavors I highly recommend adding a little garam masala to this. It’s still delish without it, but with it there is more of a traditional cashew chicken flavor. Also, you may have noticed that I have become slightly obsessed with edible flowers lately. Honestly, I am just on this whole HUGE flower thing all together. I blame it all on winter, and the need for lots of color in my life…ok and my brother Malachi’s snapchat of the 90 degree days, sunshine and flowers he has out there in LA are killing me…highly considering a move to LA. Like HIGHLY. Indian takeout, but at home!! YESSS. 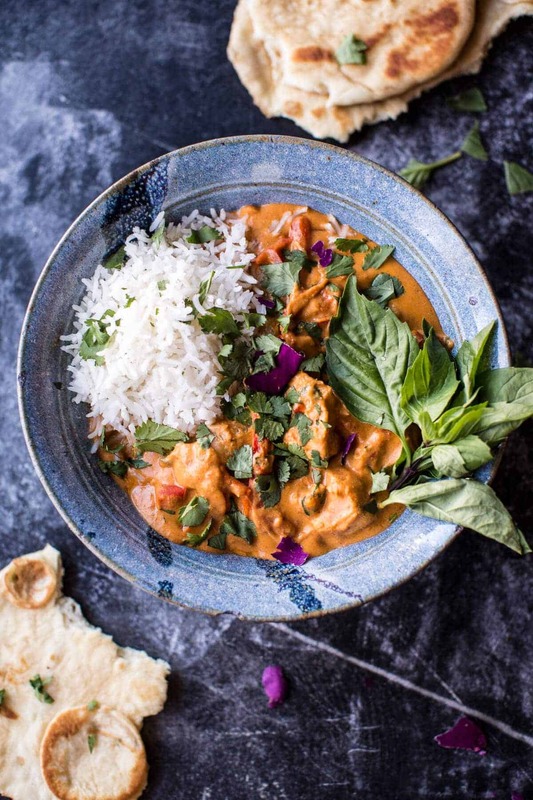 To a blender or food processor, add the cashews, onion, garlic, ginger, Thai red curry paste, chili powder, cumin, cinnamon, cayenne, a god pinch of salt and lemon juice. Puree the mixture until completely smooth. If needed, add 1/2 cup of Almondmilk Cashewmilk, to help the mixture blend. Pour the paste over the chicken. Add the remaining Almondmilk Cashewmilk. Cover and cook on low for 4-5 hours or on high for 3-4 hours. If the sauce is too thick, add more Almondmilk Cashewmilk to thin it, if the sauce is too thin, crank the heat to high on the crockpot and let cook, UNCOVERED for 20-30 minutes. This will thicken the sauce. When ready to eat, stir in the fresh cilantro. 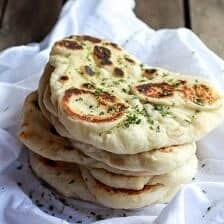 Serve with steamed rice + fresh cilantro and basil...and of course, [naan | https://www.halfbakedharvest.com/homemade-naan-step-step-photos/]! 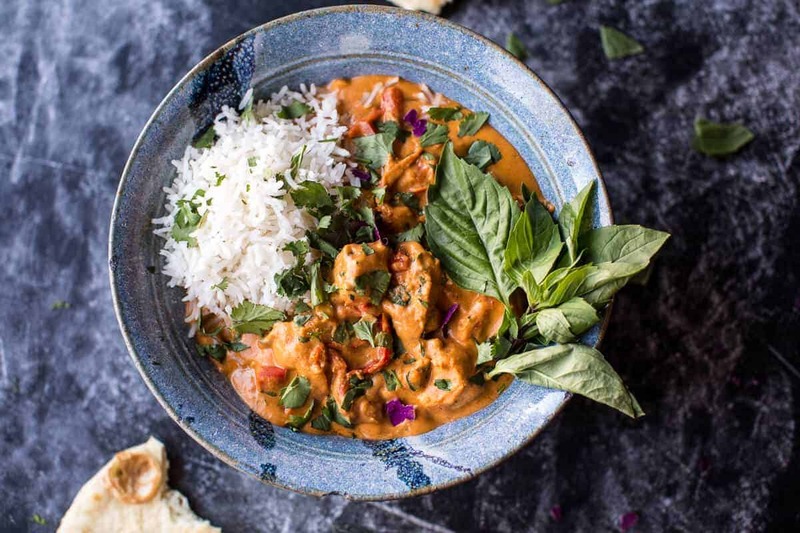 *TO MAKE THIS ON THE STOVE: To a blender or food processor, add the cashews, onion, garlic, ginger, Thai red curry paste, graham marsala (if using), chili powder, cumin, cinnamon, cayenne and lemon juice. Puree the mixture until completely smooth. If needed, add 1/2 cup of Almondmilk Cashewmilk, to help the mixture blend. Drizzle a large pot set over medium heat with oil. Once hot, add the chicken and cook for 5 minutes or until the chicken is cooked through. Add the curry paste, cashew milk, potatoes and red pepper. Cook, partially covered over medium-low heat until the potatoes are tender and the sauce has thicken, about 30-45 minutes. Stir in the cilantro and serve as directed. 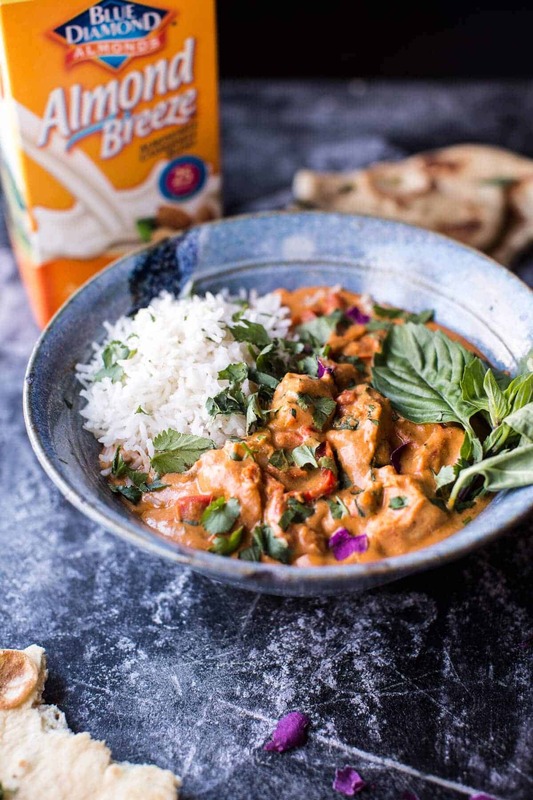 i’m not a huge fan of turmeric either- i usually just add it for the color, but this curry looks so vibrant and sunny that i won’t need to do that! I agree wholeheartedly! Curry is my favourite takeout but I would rather know whats going in my food. Yum! Do you think this would work with firm Tofu if we were trying to cut out meat? Looks amazing! I really like that tofu idea! I’m trying to incorporate more of that into my diet. We are huge homebodies too! Leaving the house some days just seems like torture. Even getting out of my career wear aka “sweat” pants” seems a struggle. Hey Kate, I think tofu would work great! I have never tried it so I cannot say for sure, but I do not see why it would not work. Hope you love this and thank you! 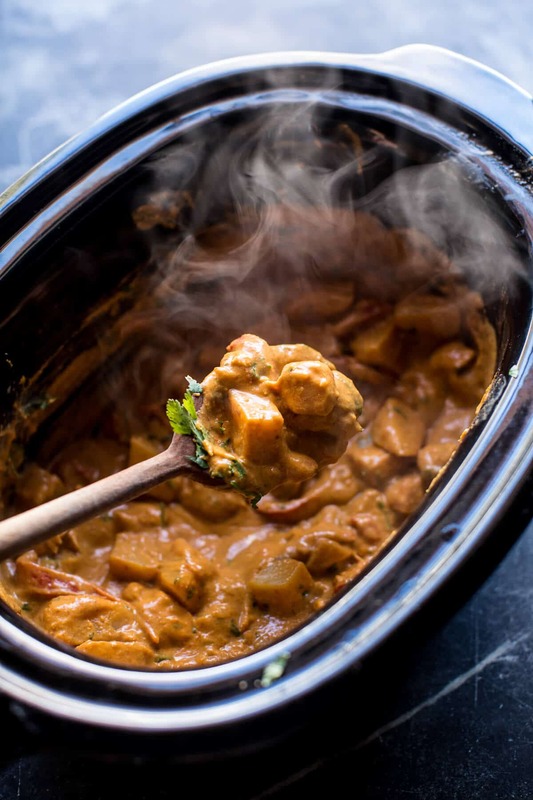 I have made the “crockpot butter chicken” with tofu many, many times and it’s such a hit with everyone. Have you tried substituting tofu on the cashew “chicken” yet? I have not, but let me know how it goes! So glad you are able to adjust the recipe to your needs! Girl, love the flower obsession lately! I agree, I could totally go for some real good warm weather, like NOW! -This crockpot chicken looks so amazinggggg! Is there anything better than something made in the crockpot that can come out looking that GOOD?! LOVE IT! Looks quite delicious, so creamy!! I have your back~! Please correct spelling. Garam Masala. Sorry about that, spelling has been corrected. Thanks! I didn’t know they made a Almond-Cashew blend. I’m going to have to put it on my list. I love the flavors you have going on — since I’m not home I’ll have to save when I have a crock pot available. Now, we’d put the chicken over quinoa. Edible flowers, hmm? I’ll have to plant some. there is a light gray box directly above the recipe ingredient list, in that box on the lower right corner is a printer icon with purple letters “print”, click this, save the recipe to your desktop and then print it later. There is light gray box directly above the recipe ingredient list, in that box on the lower right corner is a printer icon with purple letters “print”, click this, save the recipe to your desktop and then print it later. Let me know if you have questions. There’s nothing better than an easy dinner made in the crockpot and I think I’ve I found dinner for tonight. Thanks, Tieghan! Hi Kim, I am seeing it fine. Are you still having issues? Let me know, sorry for the trouble. This looks lovely. Please note that it is not spelled Graham Masala…it is GARAM Masala! This looks so rich and creamy – NEED to make this ASAP!! 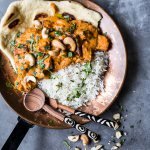 Cashewnuts are my absolute fave and anything that is crockpot friendly goes straight onto our to make list, really. 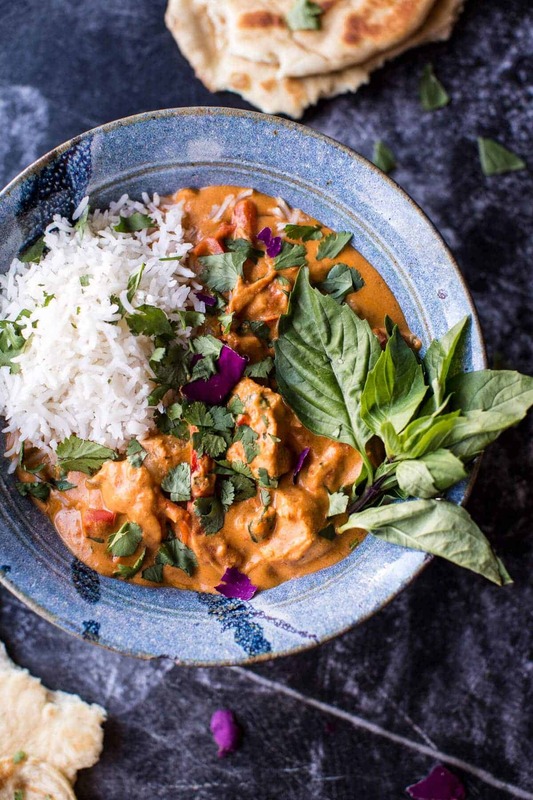 TO MAKE THIS ON THE STOVE: To a blender or food processor, add the cashews, onion, garlic, ginger, Thai red curry paste, graham marsala (if using), chili powder, cumin, cinnamon, cayenne and lemon juice. Puree the mixture until completely smooth. If needed, add 1/2 cup of Almondmilk Cashewmilk, to help the mixture blend. Drizzle a large pot set over medium heat with oil. Once hot, add the chicken and cook for 5 minutes or until the chicken is cooked through. Add the curry paste, cashew milk, potatoes and red pepper. Cook, partially covered over medium-low heat until the potatoes are tender and the sauce has thicken, about 30-45 minutes. Stir in the cilantro and serve as directed. I love indian food but never had this dish! Must try it soon. 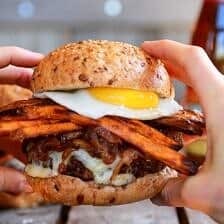 I am quite lazy too and I love homemade food but sometimes it feels so good to have food delivered just at your door. I recently took an Indian cooking class and bought all of these incredible Indian spices but I’m not always sure of what to do with them. I’m so excited to give this dish a try! Do you think regular milk would work in this recipe? HI Kristen, yes regular milk will work as well. Thanks and enjoy! This looks amazingly tasty and beautiful! Can’t wait to try it! HI! I would omit the cayenne and I think that this will be great for you then. Hope you love this! Thanks! Oh my goodness, I am sooooooooo excited to try this! I LOVE cashew chicken!!! Hello! This looks amazing and so tasty, that’s gonna be our dinner tonight ! However what quantity does “a cup” refers to ? Most likely a silly question but I have so many different size of cup at home ? 1 cup means 8 ounces. Let me know if you have other questions. Thanks! Soo I’ve been following you for a long time (like FOREVAA) but I’m not sure if I really know your whole story of how you got into this whole foodie world?? There is probably a post and I’m just blanking.. If not, I vote you do that!! Also, I vote you make a version of mushroom chicken. Cause uhm, mushrooms!! Effing HELL this looks good. OH hot damn! Sorry for the potty words, but I just had to because this looks absolutely AMAZING! 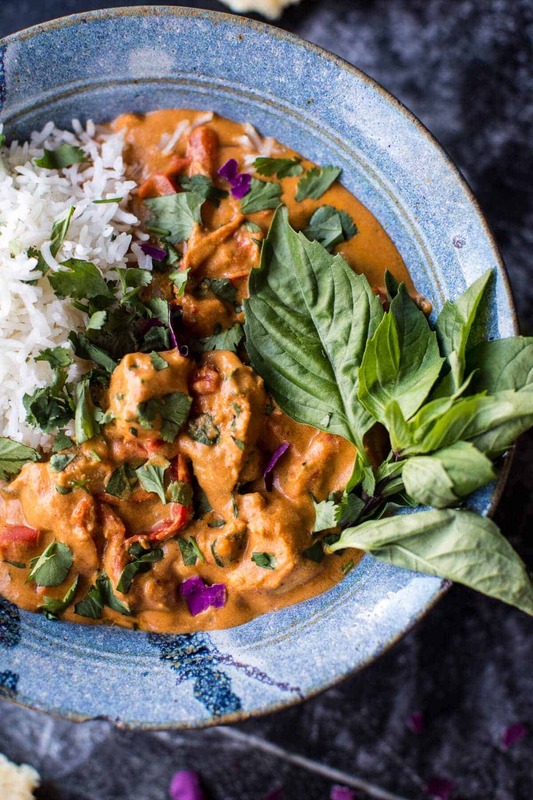 It looks like tikka masala curry, which is my absolutely favorite food in the world! Hi Tieghan! Im loving your recipes lately. I’m curious – have you ever attempted persian food? Its sooooooo good. Great flavors and lots of basmati rice 🙂 Would love to see a persian recipe from you!!! Seriously, I just had a thought. No salt?? Add a pinch of salt! So sorry about that! Smiling at you~!! Sending regards. I want you to know that I want to make this recipe. This would be something different. It looks absolutely delicious. Always love crock pot dishes. Thanks Peyton! Have the best weekend! 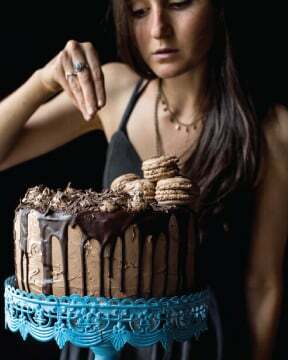 Hey Tieghan I’m going to make this tomorrow night, but the almond/cashew blend is unavailable in my area. I’m planning on blending the two myself. Do you have any idea what the ration of almond mile to cashew milk is in the Almond Breeze blend? Thanks Tieghan. I’ll go 1/2 and 1/2 with the nut milks. I was going to do that as a last resort. Can’t wait. Oh, and BTW I’m loving on this recipe. Thanks for sharing it with us. I love playing around with making curry (usually coconut milk for my base, but I’m ready to start using almond milk!). 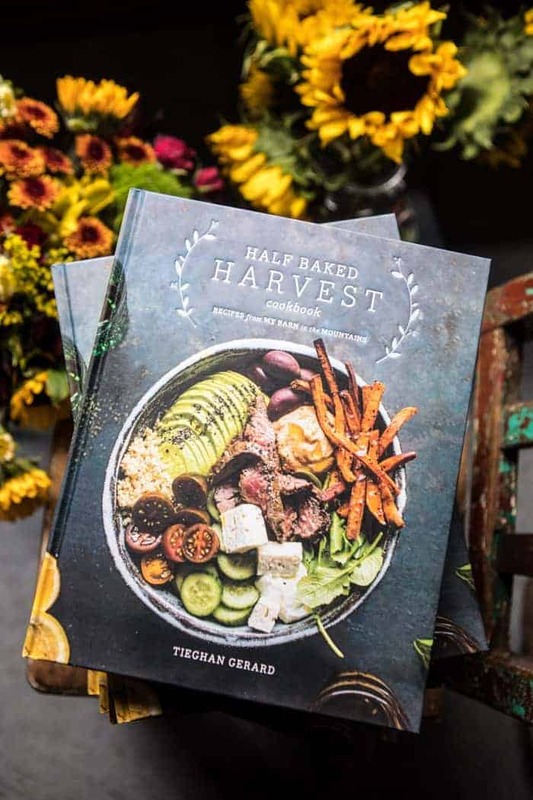 Looks wonderful, Tieghan! This recipe came together easily, looked and smelled delicious, but it ended up very bland. Definitely add salt! Looks good! My husband is half Indian so we enjoy Indian food a lot :-). I’m with you on turmeric though. A small amount in a recipe is fine, but when I see something more than 1/2 tsp for four servings I know I probably won’t like the recipe. I do sometimes add a small sprinkle to white rice along with some oil or butter to make the rice more colorful, but you can’t taste the turmeric at all. I’ve already made this twice since it’s been posted. It. Is. So. Friggin. Good. Once on the stove and once in the crock pot, both turned out equally amazing. I didn’t have cashews so I used walnuts instead…and sweet potatos. This may be one of my new fave recipes of all time! Yes that would be amazing and yes it would be 2 cups. Hope you love this and thanks!! Have made this most wonderful dish twice in 2 weeks…It is THAT delicous. Love the addition of cashew milk – first time I’ve had it and love it. Great marriage with the ground cashew. The spices are so intoxicating with the creaminess. Having to avoid carbs, used turnips vs potatoes and served over cauliflower rice. Love your blog and outstanding photography as well as your adventurous cooking/baking. You are truly living any foodie/cooks dream! I made this for dinner last night and it was delicious. I am curious, though. You used Thai curry paste in an Indian dish. Where did that idea come from? It worked beautifully, but I’m used to Indian dishes with tomato based sauces. It was a great way to get the depth of flavor and spice without watering the dish down or needing a million other spices. And without the heaviness that tomato sauces can add. I also have to add that my picky, picky husband has loved the 10-15 recipes I have made from your site. Thank you! HI! I am THRILLED that you and your family loved this recipe. it is one of my favorites too! Thai curry paste or curry paste is actually used in a lot of Indian dishes. 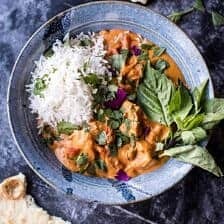 I use Thai because it it was is easily available to me, but I believe that there are Indian Curry Paste in stores as well or you can make them at home too! I also just LOVE the flavor of Thai curry paste. It’s just like what you said, it adds flavor, but doesn’t water down the dish. Let me know if you have any other questions. Thanks SO much Tibby! ? Hi Candice! Thank you so much! You can double this, but go light on the cream. Start with just a 1/4 cup and then add more if you need to thin the sauce. I think the cooking times should be around the same, just make sure the chicken is all fully cooked before eating. Let me know if you have questions. Thanks! 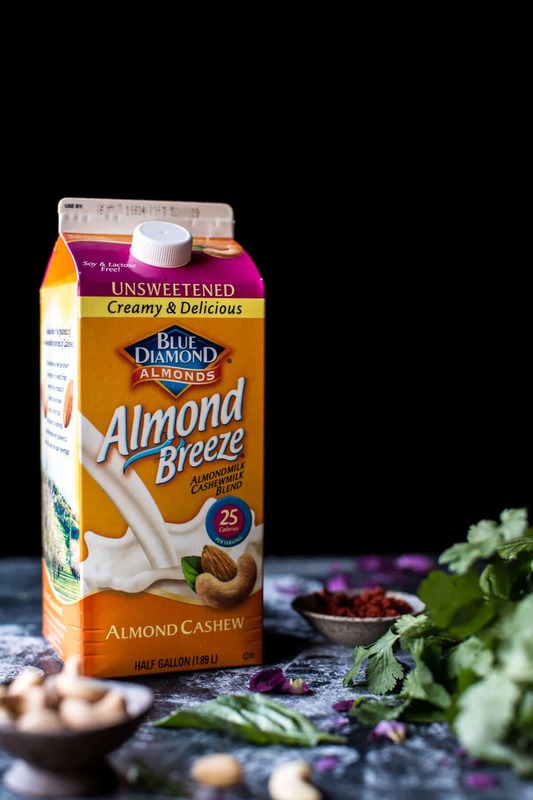 What is a good substitute for Almond Breeze Almondmilk Cashewmilk Original Unsweetened milk? Thank you!! Hey Caroline! You can use canned coconut milk or even just regular milk. Both will work great. Let me know if you have any other questions, thank you! Making this right now for dinner. Purple sweet potatoes, chicken and tofu. The smell of the sauce is intoxicating. Can’t wait to sample it. 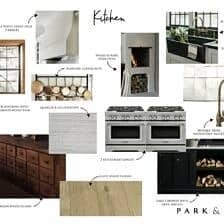 Thanks for the ideas and the beautiful rustic, pictures. So freakin drool-worthy! I made this tonight and it was a hit! We served it over cauliflower rice, which was perfect. I couldn’t find the almond milk blend so I used regular unsweetened almond milk. If you ask me, the garam masala is not optional- it seemed like a key flavor there. Can’t wait for leftovers tomorrow! Hi!! So happy everyone liked it!! 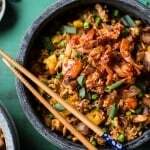 Cauliflower rice sounds delish!! How much sauce does this make? My boyfriend has an appallingly high metabolism and is trying to gain weight, and he likes to take the leftovers I make to work with him to eat for lunch. I was thinking of doubling the amount of meat used, but I don’t know if that will leave enough sauce? If you could let me know that would be great. Hey Gwen!! Hmm, it is hard to say, I think you will be ok doubling the meat and not the sauce. If it is too thick, just add milk to thin it a bit. Let me know if you have questions. Thanks! So happy you enjoyed it and I hope you enjoy the coq au vin! Thanks Gwen! I thought I had enough roasted cashews at home, but it turns out I don’t! Do you think I could use roasted almonds instead? Or will that completely change the taste, since this is a recipe for cashew chicken? Hey Anna, I think you could use almonds. The taste will be a little different, but I am sure still great. Let me know if you have questions hope you love this! Happy Holidays! If I want to double this recipe, does the cook time change or is it still four hours? I made this – I don’t know if I am a slow chopper or what, usually people say I am fast, but it definitely took me longer than 10 minutes to cut up everything, blend the sauce, prepare the chicken, etc. More like an hour. It smelled amazing, however, was SUPER bland!!!! My husband tried putting salt on it and realized that’s what it needed, a ton of salt! It doesn’t fix the problem, and I followed your recipe exactly, but I definitely recommend using 4 times as much salt, if not more, than advised on this recipe! Like, a tablespoon or more, because a pinch is not enough. It helps! Hi Michelle, i am sorry you had trouble with this recipe. some people need more salt to taste, it’s more of a personal preference thing than anything else. Again, sorry it was not to your liking. Hey Marissa, I am sorry you feel this way. Maybe trying adding more salt, as this seemed to work for Michelle. Thanks. Do you think the original cashew/almond blend is okay? I bought it already, with the intention to make this dish, so I’d prefer not to have to buy a new one. Thanks! Yes, that will be great! Hope you love this! I’m going to make this tomorrow night. My one question is – what is “2 inch potatoes”? I want to make sure I use the right amount of spuds. Thanks! What does “2 inch potatoes” mean? Could you pls provide an approx measurement in weight? So sorry so sorry for the trouble! Recipe has been fixed to read correctly. it is 2 small potatoes, cut into 1 inch pieces. Let me know if you have any other questions. Hope you love this! Thanks! I made it a couple of nights ago and used a medium sized sweet potato since I already had it. That worked great! I might even put more potato in the next time. Awesome! I am so glad you love these, Connie! I made this and it was delicious! Do you know the nutritional information for this (calories/carbs per cup?) Thanks! Hi so happy you liked it! I’m sorry but I don’t do nutritional information! This is probably a stupid question but it’s okay to put the chicken in raw right? Not a stupid question at all! Yes, you can put the raw chicken in the crockpot. Hope you love this! This is a weird mix of Thai and Indian curry flavor profiles. I knew a lot of the ingredients were not authentic Indian ingredients but gave it a go due to the convenience of using a crockpot. I think this could be good if you stuck with either an Indian flavor profile, or a Thai flavor profile. I would not recommend the recipe as is. Hi Taylor, I am so sorry you did not enjoy this recipe. 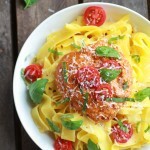 I hope you enjoy some other recipes on my blog! The first time I made the cashew butter chicken it was amazing. I followed the recipe exactly. The second time I made it I used milk instead of almond or cashew with not so great results as the milk curtled. I assume it was because of the lemon juice. Hi Marie! I am so glad you liked this recipe! Thank you! i just discovered your website and this recipe looks delicious. I dont have a crock pot but do have an instant pot. Have you tried making this in an instant pot instead? And if so what tips would you recommend. Just bought your cookbook and sent it to my aunt in Japan. How much Garam Masala would you start with? I’ve never personally cooked with it before. Very excited to try this recipe! It looks beautiful, and from all the positive feedback it sounds very flavorful! Can you make this with just Almond milk? I live in a small community and cannot get the Almond cashew milk. the directions omit some details. Do the potatoes and red pepper get blended with the seasonings, or added to the crockpot with the chicken? I cant get Almond Breeze Almondmilk Cashewmilk Original Unsweetened her.. almdon milk yes but not the mix… do I need to add more cashews to recipe? In the crockpot as we speak will post photo and results later this evening ! I cannot wait to see it! Thank you! Hi! This looks amazing! Could I do it in an instapot? Thank you so much! This looks good, but I’m confused. Indian food with Thai curry paste????? Indian and Thai curries are very different…..